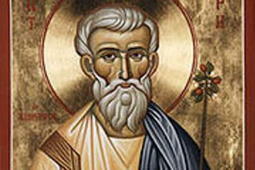 On August 1, the Episcopal Church remembered Joseph of Arimathea. Joseph was the wealthy man who asked Pilate for permission to take the body of Jesus from the cross. With the help of Nicodemus, he then prepared the body for burial, wrapped it, and placed it with honor in a rock-hewn tomb, sealing it. This much we know for sure, as all four gospels agree on the story. We know little about Joseph’s personal history. There are many colorful, apocryphal legends that followed, describing Joseph in England and even taking on an Arthurian aura, but it is his presence after the Crucifixion that speaks to me. There was no old testament prophesy that a stranger to Jesus would take on this role, yet Joseph arrived on the scene. John thought he might have been a secret disciple, but the other gospels do not share this theory. The way the story goes in my head (with no evidence to bear it out) is that Joseph was simply a good, compassionate man. Knowing of the Crucifixion and stories of Jesus’ miracles, Joseph was drawn to show kindness, respect and reverence to this man who was treated so cruelly until his violent death. Joseph wanted to do the right thing. Unlike many miracle workers and martyrs the Church reveres, Joseph just did what any of us can do. He tried to right a wrong. He applied his means to do what his heart—or maybe God, we don’t know—called him to do. He came to Golgotha to clean up after what others did, to bring some tender care to a sad ending. And he didn’t even know it would not be the end. Throughout history, when times seemed darkest, unremarkable people have risen to the occasion and remarkably demonstrated goodness, witnessed to truth, and often changed history’s course. Mahatma Gandhi. Martin Luther King, Jr. Mother Teresa. Dietrich Bonhoeffer. Rosa Parks. Malala Yousafzai . . . Their God, like Joseph’s, spoke to them, whether they heard the words or not. On August 1, my house remembers Johanna of Washington’s birthday. I was raised in the long shadow of Joseph of Arimathea and all the others who just showed up at the right time to do the right thing, a blessed history of which I hope to be worthy. Results are mixed so far. My birthday prayer, and my prayer for all of us, is that by our words and actions, we too may show up to bear witness to God’s love.